Just noticed (a bit late...) that when loading the dashboard page, the Nearby events widgets renders its template and also sends to the ARIA live region the assertive message "city updated"
this is not ideal on page load, since users haven't taken any action and there's no need to confirm an action that hasn't happened. It's also confusing and a bit annoying hearing that message every time the dashboard screen is loaded. 42037.diff​ (884 bytes) - added by afercia 19 months ago. I was able to reproduce this before applying 42037.diff​, and applying it fixes the issue for me. The message is still announce when manually changing the city, too. 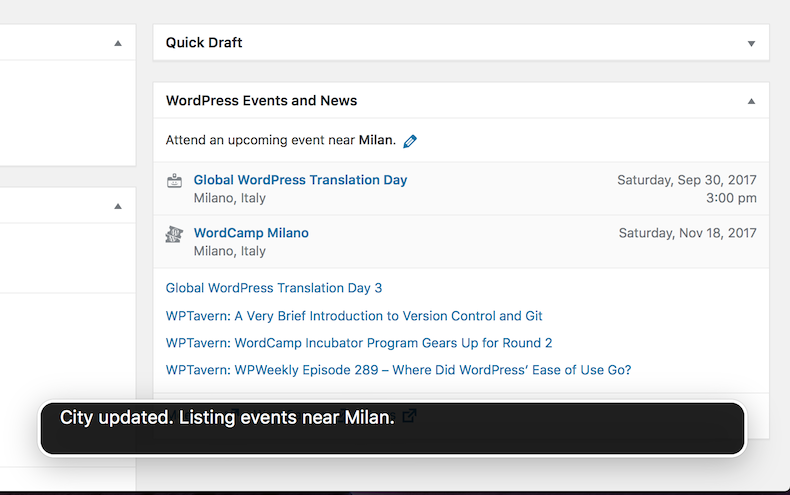 Accessibility: Improve the Dashboard Nearby Events widget wp.a11y.speak() messages. Avoids to announce the "city updated" message on page load.